Cette copropriété de 1 chambre à coucher / 1 salle de bain à Mammoth Lakes est parfaite pour une petite famille ou un groupe d'amis. Le sommet n ° 017 peut accueillir jusqu'à 6 personnes et bénéficie d'un emplacement privilégié. Eagle Lodge et Eagle Express Chairlift sont accessibles à pied ou en voiture. Vous pouvez également prendre la navette Green Line ici. La navette se rend au village et revient en hiver. Idéal pour les beaux jours, des sentiers de randonnée et des pistes cyclables se trouvent également à proximité. Une cuisine est à votre gauche en entrant dans la maison. La cuisine est bien équipée et dispose de plusieurs appareils pour aider tout chef. Le chef peut créer de délicieux repas et les apporter à la table. Asseyez-vous sur l'une des 6 chaises et dégustez un repas fait maison. Juste derrière la table se trouve un lit superposé en alcôve idéal pour accueillir les enfants. Le salon est relié par un plan d'étage ouvert. 2 canapés entourent la télévision et la cheminée. Allumez un feu et installez-vous confortablement en regardant un film. Un lecteur de DVD, un magnétoscope et une chaîne stéréo sont disponibles pour votre divertissement. Le canapé sert également de canapé-lit pour 2 personnes. Si vous avez besoin d'air frais, sortez sur le balcon et profitez de la vue environnante. La chambre principale est au bout du couloir. La chambre est meublée avec un lit king-size confortable. Il y a une salle de bain complète pour les invités. Pendant vos vacances, veillez à utiliser les nombreuses commodités offertes par le Sommet. Il y a une place de parking souterrain, une laverie commune, une salle de sport, des stations de barbecue, une terrasse et un sauna. En été, les courts de tennis, les bains à remous et les piscines sont ouverts. Remarque: Le bois de chauffage n'est pas fourni. Il n'y a pas d'internet dans cette maison. 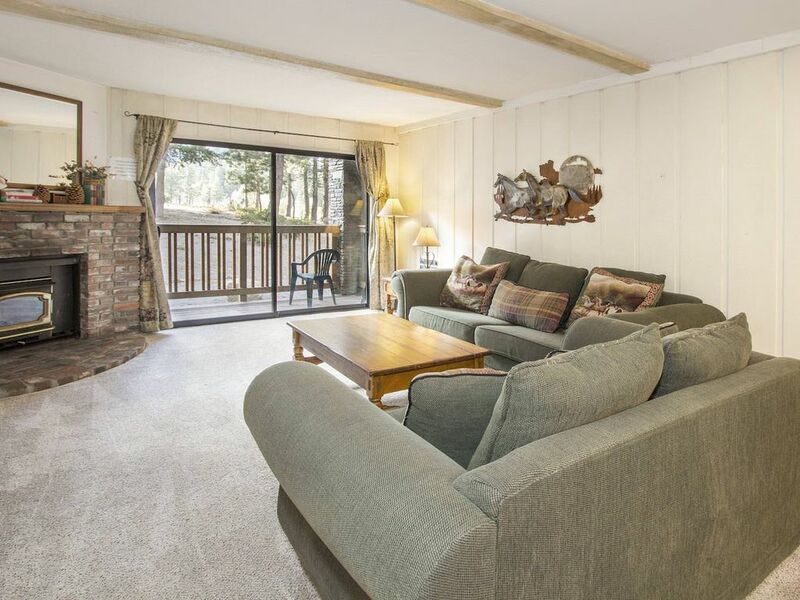 This condo unit is within walking distance to Eagle Lodge. That is the redeeming factor of the condo unit. The carpet is dirty and needs to be replaced. The couch is dirty so we had to put a sheet on top of it to sit on the couch. We don't mind staying in older places, but this place is dirty and in desperate need of TLC. Those simple changes will make it a great place to stay. This unit definitely is in a good location! I will talk over these issues with my management team and we will get these fixed! Thank you for sharing your experience and we look forward to hosting you again. Condo was like walking back into the 1970s or 1980s, but this was fine as it is advertised this way. It was clean enough and beds were comfortable. Kitchen was fine (except no plastic cutting board and no saran wrap). It is very close to Eagle Lodge, which is nice. Note: Contract clearly states "all kitchens equipped with coffee maker"
2 - Considering all the stern language in the contract about paying for damages, I thought, like a rental car, I should point out the pre-existing damage. There was broken tile (with a big chunk missing) in the entry way (don't go barefoot! ), and the door to the bedroom was broken. 3 - Check out time is 10 AM which is fine. But they also insist on getting keys delivered back to their office by 10 AM. So instead of hitting the ski slopes out the door, you have to drive into town to their office, then drive back. Defeats the purpose of having condo next to lifts (for the last day at least). 4 - Hot tub is not hot. It is luke-warm at best. Big disappointment after a long day of skiing. First of all, my unit was not ready when I arrived at 4:00 pm. They asked if we can come back, they did not even give us the keys to the unit. We came back at 6:00 pm, the Unit was not ready and they indicated it will be ready in 1 hour, this time they did give us the keys. When I first walked into the condo unit, I noticed the carpets was very dirty and full of stains. It appears this unit has not been cleaned properly. There was a lot of other issued with this unit. The lights in the vanity area was not working, the shower nob will not open probably, the dishes, cups were stained and not cleaned properly. This unit is a total mess. We complained and they did sent personnel to repaired the faucet and the lights. The faucet was repaired temporary, due to the fact they need to shut the water off and replaced the stem in the faucet. The fluorescent lights could not be repaired, the blast had to be replaced. All these problems was brought to the attention of the Manager. The personnel who made the repaired took pictures of our complaints. We also took pictures. The make matter worst, in our final night of our stay, we saw a mouse in the fireplace area. When we checked out, the management was aware of all our problems. It was indicated we would be compensated for our inconvenience. I have yet received a call back from Grand Mammoth Resort. I do not recommend doing business with Grand Mammoth Resort.